The beer side of my blog has been rather neglected over the past couple of months, possibly because my work-life-balance is a bit hectic at the moment and I’ve also been exploring wine more and more. However over the last couple of weeks I’ve tried some FANTASTIC beer that I just have to shout about. All of these beers are available to buy around Edinburgh and I’d seriously suggest giving them a go if you like Real Ale/dark beers. If you’re a Real Ale drinker in Scotland you’ve probably heard of Orkney Brewery and if you drink dark beer, you’ve probably heard of Dark Island. Orkney Brewery have used their hugely popular Dark Island Ale and matured it in Orkney malt whisky casks to create a beautifully strong, incredibly rich aged ale. The high ABV of the ale (10%) means that the ale is designed to be enjoyed much like a liqueur or whisky and the bottling of the beer reflects this. The beer therefore has a much longer shelf life than a usual beer. 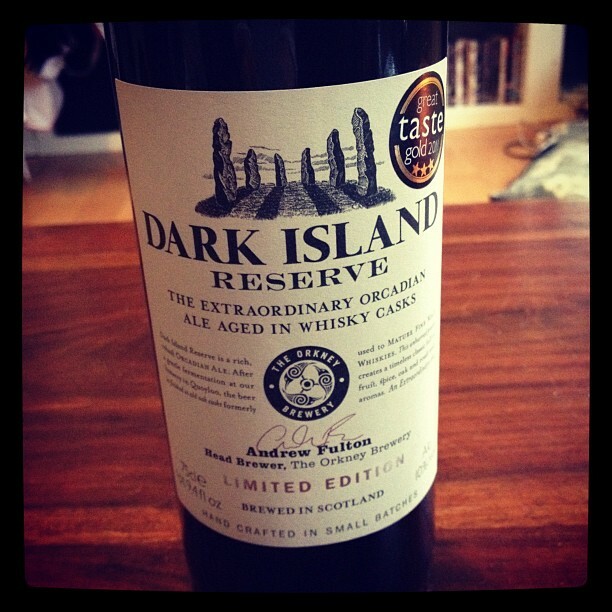 Dark Island Reserve still has all the desirable flavours you’d expect from the original ale; dates, spices, heavy chocolate, coffee and a hint of acidity but also has the added richness and woodiness from the whisky. Dark Island Reserve is a truly beautiful beer and although I’ve finished the bottle there is a 100% chance I’ll be buying another bottle closer to Christmas. It’s the perfect ale to savour after a long winter walk with my spaniel and I would recommend this beer to anyone that likes whisky and dark beer. I saw this in a shop window and was firstly intrigued by the idea of an Icelandic brewery and then realised it was a toasted porter and HAD to try some, I’m so glad I did! The Brewery is located only 60 miles from the Arctic Circle and the water used in the brews run through prehistoric glaciers which produce some of the purest water in the world. This element could explain the clarity and crispness of the ale. The Toasted Porter is absolutely beautiful, a thoroughly enjoyable beer. There are obvious notes of toffee and chocolate but the beer appears to remain light and extremely smooth. It is malty and very easy to drink, I’d recommend this even to those that don’t drink dark beer. My fiance for example is not a fan of ale at all and found this really enjoyable. 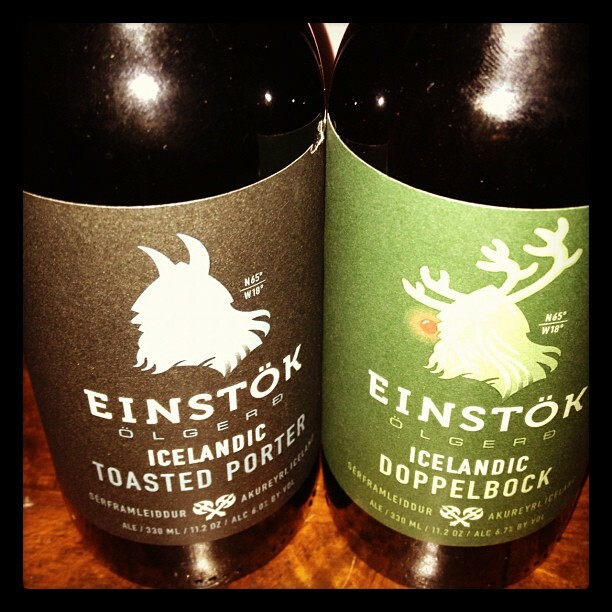 We bought a couple of other Einstok beers too; Icelandic Dopplebock and White Ale, both of which are definitely worth trying but my heart lies with dark beers so the Toasted Porter was my favourite. This is one of the most awesome beers I’ve had in a long time, seriously! I bought a milk stout a couple of months ago from a brewery I’d never heard of and it really wasn’t good, I mean it was rank. So I was a bit dubious when the shop assistance recommended another milk stout. I’m not one to judge so I thought I’d give it a go. This milk stout is sweet, totally smooth and incredibly drinkable – even pouring it into a glass was a great experience! Left Hand Brewing Co is based in Colorado in the US and I’m quickly coming round to the idea that America are making some incredible craft beers. Back to the beer – the stout is really, really creamy without being TOO creamy and the more you drink the more you get of a lovely warming coffee flavour, I love a beer that develops! I promise you’ll be able to drink bottles and bottles of this but be careful because its medium-to-high ABV (6%) is amazingly disguised. After having a look on their website I discovered that the beer has won a load of awards, apparently it’s not just me that thinks this beer is brilliant. I spotted a can (yes, a can) of this in one of the fridges at the Bow Bar in Edinburgh and couldn’t resist. The can was rather expensive but you only live once and how often do you see a beer brewed in Hawaii. I really enjoyed this beer but I must admit I was a tiny bit disappointed by the depth of taste. 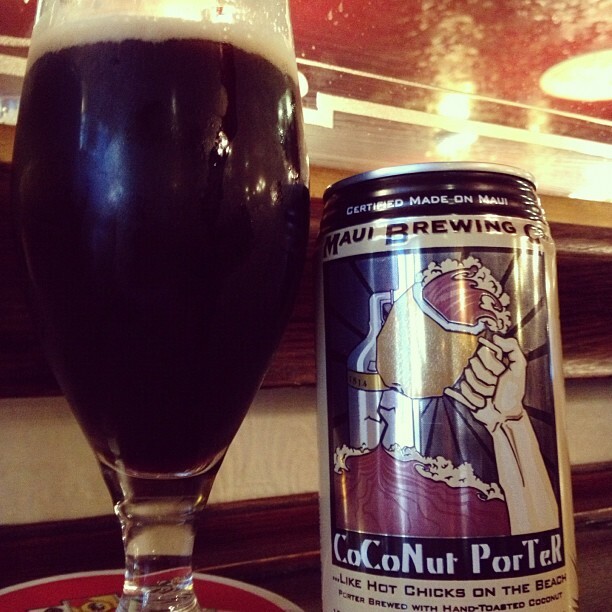 I’ve tried a couple of Coconut Porters in the past included the brew by Stewart’s Brewery, which is really good. I have to admit I compared it a little. I think the thing that threw me the most was the fact that it was heavily carbonated, I think the coconut flavour is a lot more evident in a cask beer. The beer did however have a wonderful texture, especially considering it came out of a can! You still get hints of everything you should, malt, coffee and of course coconut. There you have it, as you can see I’m having a bit of a moment with dark beers – I think it’s the impending winter and cold weather. Hopefully the response to this blog post will encourage me to blog more about my adventures with beer (and then I get to drink more beer too obviously). Let me know if you’ve tried any of the above beers and tell me what you thought, beer tasting is very subjective and I’m always interesting to see what other flavours people get from the beers. Happy beer drinking! Last night was my first experience of Burgher Burger. I’ve mentioned this is a earlier post but for those of you that don’t know Burgher Burger is a guerilla dining experience where several different chefs produce a menu (including a burger, obvi) and host an evening at ‘greasy spoon’ cafes around Edinburgh, oh and the menu is matched with beer. This is the third time we’ve tried to get tickets for the event as the tickets sell out in under a minute, the current venue only holds about 35 people so trying to get a ticket is pretty competitive! The evening was brilliant, the food perfect and the atmosphere buzzing, the beer was pretty gorgeous too (supplied by Harviestoun Brewery). Here is the menu, along with tasty, tasty photos. The starter was lovely and flavoursome, the peppery mussels and fresh coriander tasted great alongside the battered sweet corn rosti that was served on the side. It also went great with the citrusy Bitter and Twisted. Oh my gosh, this was amazing! The burger was perfectly rare, the chips were crispy and salty and the buffalo mozzarella was to die for. It doesn’t sound like the most exciting burger on paper but it definitely works, especially with the Wild Hop IPA which was fruity and fizzy! Plums, cream, nuts, milk – you can’t really go wrong here and served with one of my favourite dark winter beers. They did really well serving this dish as it wasn’t a huge portion and complemented the rest of the meal perfectly. All in all my boyfriend and I had a really great evening and would definitely do it again, soon if possible! The food, service and atmosphere were all enough to make the evening a success! Thanks for a great night Burgher Burger! I’m a bit behind for March (sorry). I baked this bread at the end of March but haven’t got round to blogging about it yet. So basically, I had a pretty indulgent March, eating way to much bread and other naughty things. So I decided to cheat, just a little bit. Banana bread isn’t technically bread, although it has bread in the name, so ha I win. The stout and poppy seeds were my own additions; I was enjoying the stout whilst I was cooking and it seemed like a good idea to substitute some of the buttermilk for some stout… The addition of poppy seeds was because, well I like poppy seeds. This recipe was really easy and fun to make and the uncooked mixture tasted almost as good as the finish article. There are a couple of key elements to making this recipe perfectly. Firstly, make sure the oven is fully pre-heated before baking your bread, this will stop soggy or burnt bottoms which ultimately ruin any cake or bread. This recipe requires you to cream the butter and sugar; ensure there are no lumps before adding any other ingredients, the cream mixture should turn a very pale yellow colour. Then fold in the rest of the ingredients, making sure not to take all the air out of the mixture. It says to mash the bananas, I mashed 2 bananas and thinly sliced the rest to give the bread more texture. The recipe calls for it to be baked for about an hour, mine took a little bit longer but I think that’s because my oven is rubbish. The easiest way to check if it’s cooked is the most traditional way, stick a knife in it, if it comes out clean it should be cooked. The top of the bread should be firm and golden grown. So how did it taste? This is a very naughty, moreish bread and is the perfect accompaniment to a cup of chai tea. The bread has a cake-like moistness to it and the banana, vanilla and caster sugar make it lovely and sweet. This means it doesn’t need to be served with anything on it at all. I tried a couple of slices with some toppings, one with butter and one with peanut butter – both were lovely and made me want more and more. The stout gave the banana bread a lovely rich, nutty flavour – I can’t imagine the banana bread without the addition of stout now. The poppy seeds gave the bread lots more texture, check your teeth after you’ve had a slice though. I usually steer away from flavoured beers. The flavours are commonly overpowering and they are sickly sweet, however I’d already picked up a Crabbies (shut up it’s tasty) so decided another sweet beer wouldn’t hurt. Orkney’s Clootie Dumping ale caught my eye, mostly because of the tasty looking dessert on the bottle and a little because Orkney aren’t the type to do a tacky flavoured beer. Orkney are one of my favourite Scottish breweries and brew a couple of old favourites that I used to serve regularly at the bar I worked in throughout university. They are quite a traditional brewery in terms of the ale they produce and don’t normally experiment with extreme flavours or hops. Orkney’s Clootie Dumpling isn’t an exception to this. Don’t get me wrong, it’s a lovely beer but it’s not something that is going to blow your mind. Clootie Dumpling is a traditional Scottish dessert made with flour, breadcrumbs, dried fruit, suet, sugar and spices, the beer has been produced to match these flavours. 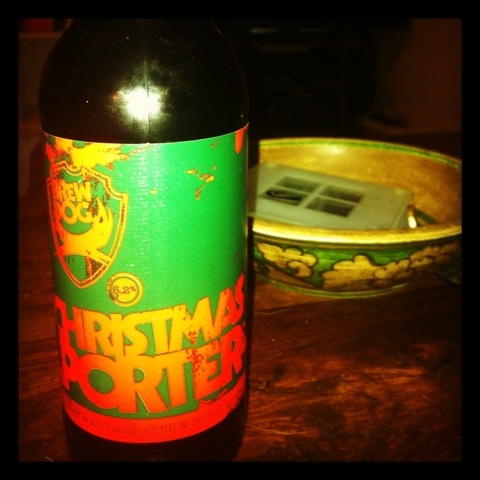 Bearing these flavours in mind, when I opened the beer I was expected a rich, thick dark stout or porter. Instead the ale is toffee in colour and light in texture. I also expected a thick, heavy head but was instead met with a frothy light foam that quickly disintegrated. On the nose the ale has a wonderful aroma of banana, cinnamon and ginger. It has a subtle smell of lager and doesn’t smell entirely as an ale usually does. It also smells a lot like a ginger beer and shares the same texture as a ginger beer or cider would have. It has the smell of a very light amber with some added yeastiness. The aromas follow through in taste with some added spiciness and the flavour of fried fruit to match the characteristics of the traditional Clootie Dumpling. I lost the taste of banana that was so present in the smell, which is a little disappointing but there is enough going on with this beer to keep me interested. Something that I definitely didn’t expect from this beer (judging by the packaging and description) was that it would be a really easy drinking beer. It’s has a low abv. (4.2%) and is light enough in flavour to be a session ale but it is definitely more interesting that your standard IPA or light ale. The spiciness is kept in the aftertaste and in that way reminds me again of a ginger beer. It’s not your typical seasonal ale and I definitely don’t think it represents Winter; maybe Autumn. It’s really nice to be surprised by the labeling which originally gave me the impression that it would be a sickly sweet dessert beer. It is subtle, sweet but not too sweet and was a very nice beer, if I do say so myself. I put of swig of it in my Shepherds pie and drunk the rest. If this sounds like the beer for you, get in there quick as it won’t be around after early February.